A new study in Parkinson's proves the value and clinical impact of patients using their own devices to capture and monitor symptoms and treatments. 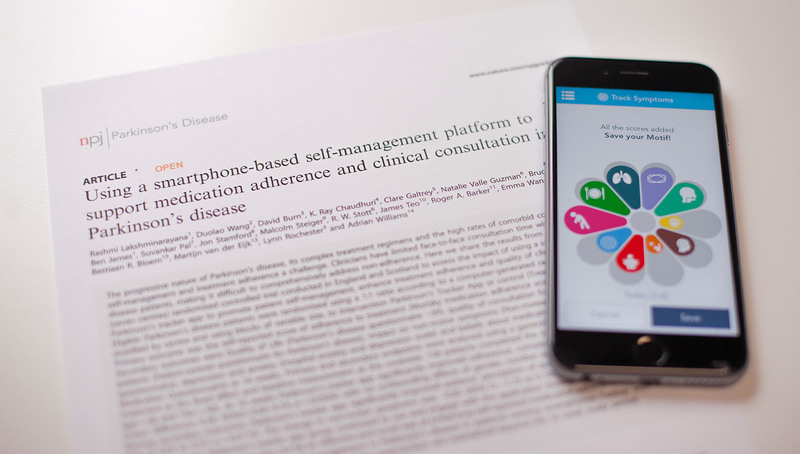 Results from a trial in the NHS of a digital technology for Parkinson's Disease shows that patients are more likely to adhere to their medication, benefit from higher quality doctors' consultations and take more control of their condition and treatment when given access to a specially-designed digital health app based on the uMotif platform. Published this week in npj Parkinson's Disease, the results from the world's largest successful randomised controlled trial of a digital technology for Parkinson's Disease, shows a 10% improvement in adherence and a significant improvement in patient's experience of care. Funded through the Department of Health's medicines management Small Business Research Initiative competition, the Smart PD trial used the uMotif digital platform in seven of the NHS's leading neurology departments to test adherence, patient activation and the experience of the NHS care of over 200 people living with Parkinson's. It found patients were more engaged, stuck to their medication better and had better consultations with their clinical teams. Parkinson's affects 1 in 500 people, with over 127,000 people in the UK and around 6.3 million globally, and costing the NHS almost £1 billion per annum. If rolled out to neurology departments across the UK, the uMotif platform could save the NHS over £20m in Parkinson's each year. The platform is also used in 15 other clinical conditions, which could save the NHS over £1 billion each year if the uMotif platform were made available to the 15 million patients with other Long Term Conditions. Patients on the trial used the simple uMotif tracking app to record their symptoms, medications, play cognitive games and keep a regular diary over a 16 week period. By capturing their own patient-generated health data, patients saw a 10% improvement in their adherence to prescribed medications, and reported a better quality of follow-up consultation with their clinicians. Bruce Hellman, CEO of uMotif said “these important results demonstrate that putting patients at the centre of their care makes a significant impact to healthcare and research. We were also excited to prove that patients of all ages are able to use their own devices to capture high quality health data on a regular basis." Nicola Blackwood, Minister for Public Health and Innovation said: “Technology is transforming care and the patient experience. “I'm delighted to see that the Department's Small Business Research Initiative has delivered results leading to better outcomes for patients across the country. “Integrating technology into every day treatment offers potential benefits for patients, carers and healthcare professionals. I am determined to make sure our NHS embraces technologies like this." Tom Isaacs, Co-Founder of the Cure Parkinson's Trust said “from a patient's perspective it's great to see evidence that digital technology designed and built for patients to capture their own data has an important impact on clinical care. We hope that this type of technology is adopted quickly by people with Parkinson's so that its use becomes the rule rather than the exception." Julie Dodd, Director of Digital Transformation and Communication of Parkinson's UK said “we were delighted to support this study and look forward to seeing how further use of tools like the uMotif platform can help patients, carers and clinicians to improve care for people with Parkinson's"
Juliet Bauer, NHS England's Director of Digital Experience said “'today's NHS is all about embracing proven new technologies like uMotif's to make a difference to patients' experience of care, and to help to improve services across the country. We're delighted to see the growing evidence base of how such technologies can make a real difference." uMotif is now available for neurology and other Departments and GPs across the world to support their patients; and for clinical researchers to capture high quality patient reported health data.